Click Burgundy East or Burgundy West on the map below for full information on cruising areas. Click on base names for detailed maps and cruising routes for cruiser boats and penichette boats. Our Burgundy cruising areas in Central France offer a classic French experience. Eastern Burgundy offers picturesque cruising, fine wines and gourmet cuisine in a landscape rich with natural beauty - pine forests, waterfalls and mountain scenery sit alongside rolling pastures, meadows of flowers and fields of wheat. Western Burgundy offers splendid chateaux, peaceful landscapes and pretty waterways - some of the most beautiful and varied cruising areas of France - easy to reach by car or train from Paris. In Eastern Burgundy our cruiser boat base at Fontenoy-le-Chateau is set against a backdrop of the Vosges mountains, and our St Jean de Losne base is at the centre of Burgindy's waterways. Our penichette base at Scey-sur-Saone is on one of France's most attractive rivers, and further south our bases lead into vineyard country. 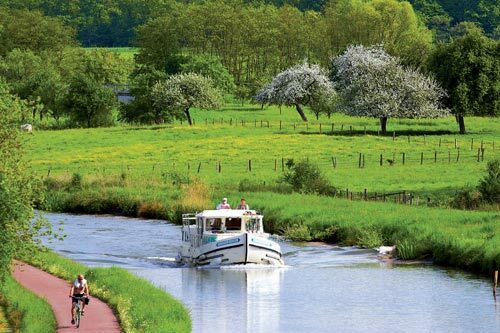 In Western Burgundy our cruiser boat bases are superbly located on beautiful waterways. Our penichette bases all have access to the pretty Canal du Nivernais.